Back labor occurs in 25% of labors. Find the causes, signs and relief measures with our free download. Back pain is a common problem in labor. There are basically two main types of back pain experienced by mothers. The first, and most widespread, often occurs at the onset of labor as the uterine contraction pulls the ligament that attaches the uterine muscle to the sacrum. The second, and more painful, type of back pain occurs in approximately 25% of labors. This back pain is referred to as back labor, and occurs because the baby is facing the mother’s abdomen with the back of the head pressing against the sacrum. Back labor tends to be much more painful than other labors and is often longer and more difficult. Pain medication and other interventions are more common with back labor. The first goal is to prevent back labor, which is described in the section on optimal positioning in pregnancy. The clinician often can tell the mother at her prenatal appointments the last month of pregnancy if the baby is anterior or posterior. If the baby is posterior, the mother should spend 30 minutes in the all fours position several times a day. If the mother has a posterior baby as labor begins, her goals are to turn the baby to an anterior position as soon as possible, and also to cope with the back pain. Positioning and movement are the two strategies to turn a baby. The all fours position, or standing and leaning all the way forward help to turn the baby. With these anterior positions, the heavier half of the baby will be pulled towards the floor, which will direct the baby into an anterior position. These are not positions that many women can maintain for long periods of time, so it helps to find other positions to intermix with these. An important consideration is to keep the pelvic outlet open, so any of the squatting, kneeling, standing positions are helpful. Some women have used the toilet as an open pelvis position that gives their legs a break. The three quarter lie, with the top knee bent and pulled towards the face, is also used if the mother needs a rest break. Positioning a woman with the fitness ball is an asset in back labor. She can use the ball to support her in an all fours position. A favorite position is to place the ball on a bed and have her lean over it. She can rock back and forth in this position. Learn more about positions for childbirth. Movement also encourages the baby to turn. Pelvic tilting is frequently used and can be done in any open pelvis position and in time with the mother’s breathing. The lunge is another movement that is encouraged. The mother has one leg on the floor with the foot pointing forward, and one leg on a stool pointing to the side. She slowly lunges shifting her weight to the foot that is raised, expanding the pelvic outlet sideways. The hip cradle provides passive movment for the mother. A sheet or rebozo is wrapped around the mother’s pelvis while the two ends are held by her partner(s). The sheet cradles her hips, so that the top of the sheet is a little above the hip level (at or slightly below waist level) and the bottom of the sheet is at the bottom of her buttocks (about where the back of the thighs start.) The mother leans back into the sheet or rebozo, and at the same time brings her shoulders slightly forward. This creates a slight V shape in the mother’s position with her hips as the fulcrum of the V. Then the partner slowly and gently pulls first one side of the sheet, and then the other, creating a rocking motion. Some women have also reported an increase in contractions with this technique. Find more ways that movement in labor can benefit the labor process. Abdominal lifting is covered in detail on another page. Basically, this technique directs the baby’s head into the pelvic funnel and encourages turning. This can be done with the mother pelvic tilting to encourage the descent. The primary concern with abdominal lifting is that it is not recommended until the mother is at the place of intended birth, in case the descent occurs quickly. The double hip squeeze is another technique that is applied to the mother to help turn a baby. The partner places his or her hands on the side of the mother’s hip. The fingers of the hands should be spread apart, and the thumbs pointing back towards the person doing the squeeze. It may help to kneel or sit on a low stool behind the mother. With the hands in this position, the partner presses the palms inward and slightly upward, as if trying to bring the lower palms and wrists towards each other. This widens the pelvic diameter, giving the baby more room to turn. The lateral hip press is a variation on the double hip squeeze. It is usually used when there is a doula present, since it requires two people. Each partner is on either side of the mother, and their hips touching hers. They are all lined up facing the same direction. They may link their arms behind each other, as if they were in a chorus line and getting ready to do can-can kicks. (The kicks, by the way, are not recommended in labor.) Instead of dancing, during a contraction both partners press the sides of their hips towards the mother’s hips, causing expansion of the pelvic outlet. Some practitioners use the “Warm Tummy--Cold Back” routine. Many babies seem to turn towards warmth. Therefore a warm blanket or slightly warm heating pad is placed on the mother’s abdomen, with an ice pack or cold pack on her sacrum. Incidentally, this is also comfortable for many mothers, and seems to help convince some little ones to turn. In addition to trying to turn the baby, the mother also needs assistance with dealing with the pain of back labor. This can be done through several strategies, which require the assistance of her labor partner. Counter pressure is the placement of pressure on the sacrum over the area where the pain is located. It is usually done during a contraction. Some mothers like the pressure to be continuous during and between contractions, while others prefer the pressure to be removed after the contraction is ended, or a soothing massage to be done between contractions. The partner needs to communicate with the mother regarding her desires for touch between contractions, and to be in tune with her when the contractions begin. Counter pressure can be applied through various devices. The partner can interlock his or her fingers and apply pressure with the heel of the hand. Some people utilize various massage tools that can be used on the back. Improvising with a tennis ball, rolling pin, or cold beverage can have often been used – and some prefer them to the more expensive massagers. Counter pressure can also be applied by the mother sitting against her partner’s knee. This is called the Knee Up position. The partner leans against a wall with one knee bent and the bottom of the foot placed against the wall. The mother sits against the leg with pressure applied to her back. The knee press is done with the mother sitting with her back several inches forward from the back of a chair. The partner faces her while kneeling. One hand is cupped over each knee. The partner pushes the knee straight back, causing the mother’s back to go into a pelvic tilt. This relieves the pressure off the back for a lot of women. Heat and/or cold can also be applied, depending on the mother’s preference. Cold application can be done with a cold pack, with a bag of frozen vegetables, cold beverage, or wet wash cloth that has been frozen in a baggie. Heat can be applied with a heating pad, warm pack, rice or bean bag that has been micro-waved, or warm water in the shower that is directed at the lower back. The birth ball allows all techniques mentioned above to be used simultaneously. If the mother kneels with her upper body supported by the ball, she can maintain an optimal position for the baby to turn, but also rest with her weight supported by the ball as a pillow. She can pelvic tilt or rock back and forth on the ball in order to move the pelvis. She can use her breathing in time with her movements. Her partner can apply pressure and heat/cold applications at the same time. A similar strategy can be done with the mother standing and leaning into the ball which is placed on the bed. Standing also allows the mother to do abdominal lifting which was described in the last section. Some clinicians have used sterile water injections at four points around the sacrum to bring amazing relief for back pain. A mere one milliliter of sterile water is injected intradermally, much like a Tb test. At the time of the injection, the mother feels a stinging sensation, like a bee sting, that disappears within a minute, along with the back pain. She continues to feel the contractions in the abdomen, but without back pain. The pain relief lasts about 45 to 60 minutes, and can be repeated if the mother wishes. Our brochure Dealing with Back Labor lists multiple strategies for turning the baby and for reducing the discomfort. 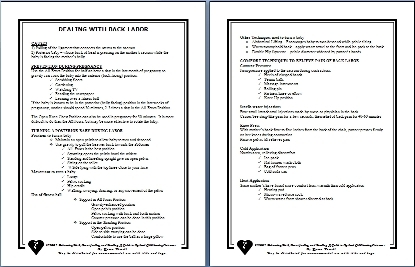 Print the brochure and keep it with you in your labor bag. You just may need it! Return from Back Labor to the Better Childbirth Outcomes HOME PAGE.